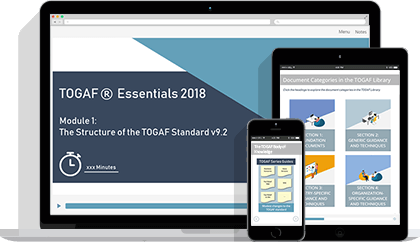 Study for COBIT 5 Certification at Foundation level with this fully-accredited online training course from Good e-Learning, the IT Governance and Compliance training experts! 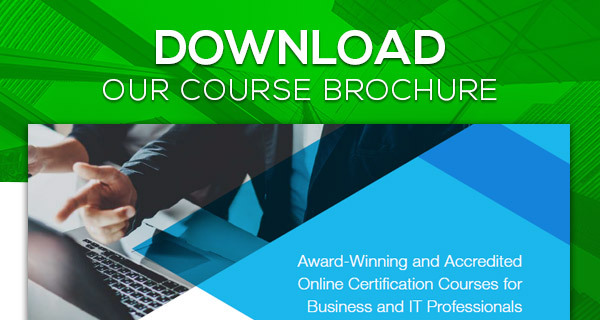 This course comes with a FREE exam voucher and has been created in collaboration with leading IT Governance experts to provide students with everything needed to pass the official COBIT 5 Foundation examination. 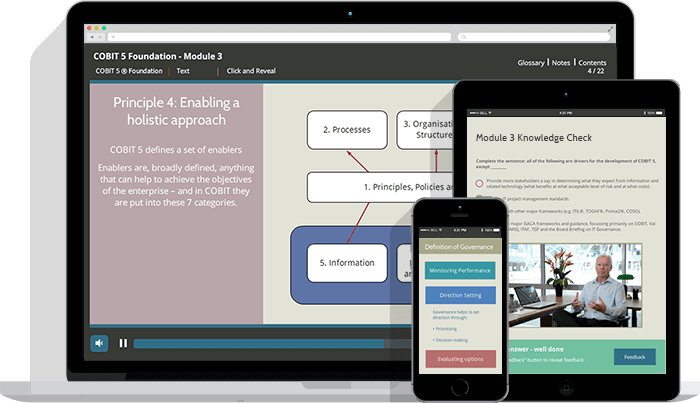 The COBIT 5 Foundation qualification is a prerequisite for advancement to higher levels of COBIT 5 accreditation, such as COBIT 5 Implementation and subsequently COBIT 5 Assessor. COBIT® is a registered trademark of ISACA and the IT Governance Institute. COBIT aims to research, develop, publish and promote an authoritative, up-to-date, international set of generally accepted information technology control objectives for day-to-day use by business managers, IT professionals and assurance professionals. 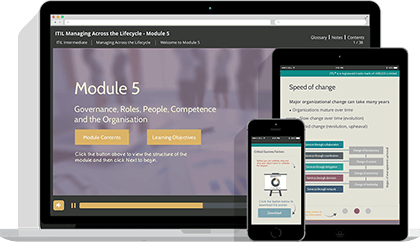 This course is ideal for individuals or teams who wish to develop an understanding of COBIT 5 and achieve a recognized qualification that will demonstrate their ability to apply COBIT 5 in practice. 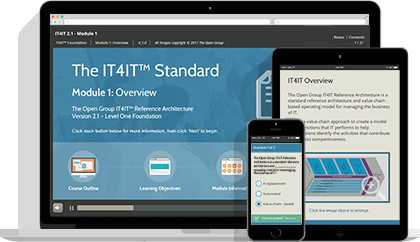 Become a certified COBIT professional, and join the elite group of qualified COBIT 5 professionals worldwide! 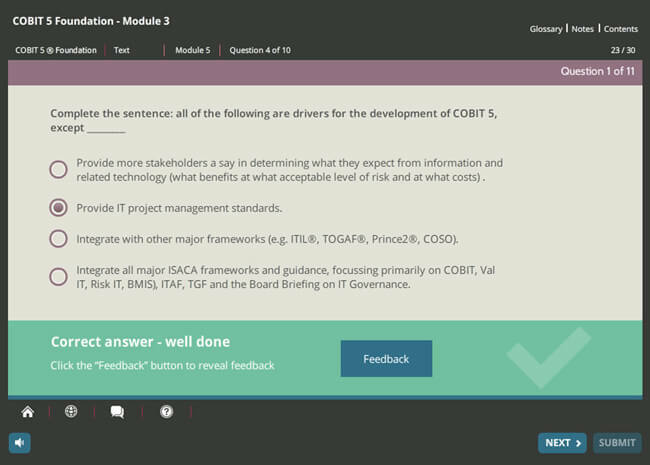 Upon successful completion if this course, students can request a FREE exam voucher when they are ready to sit the official COBIT 5 Foundation examination. 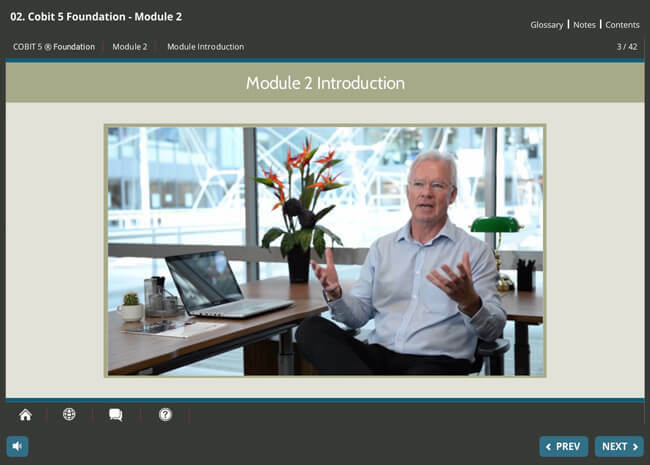 This modules is designed to set the tone and set your expectations for the rest of the course. 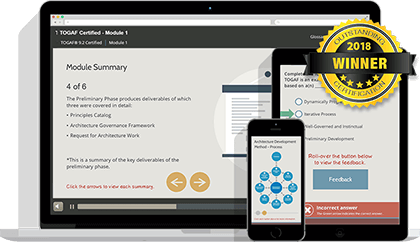 This module will show how COBIT 5 achieves its role as a single and integrated framework, which is a considerable achievement, given the number of different frameworks available in the IT operational and planning sphere. 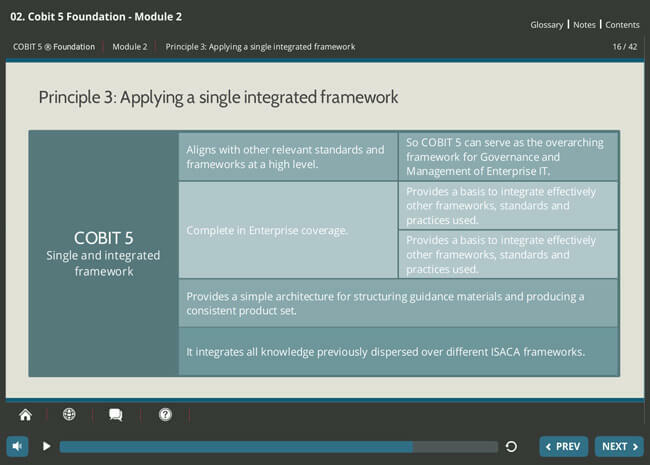 This module describes the COBIT 5 architecture and how it achieves the integration and alignment within a single framework by bringing together existing and new ISACA material with new guidance, as well as other standards and frameworks. Before starting on the COBIT 5 journey it is necessary to establish the context within which the framework is relevant and useful. 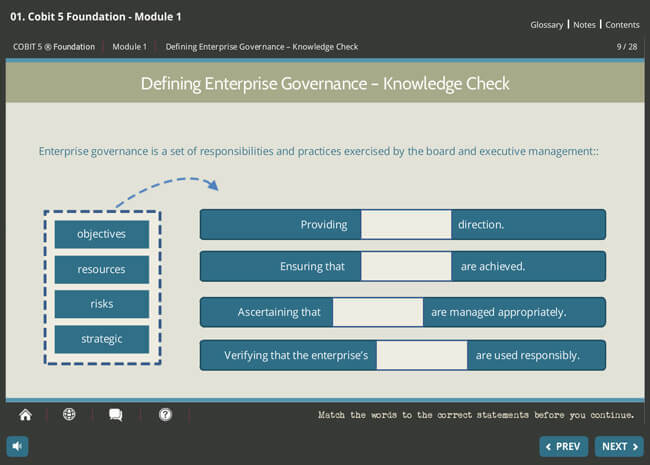 To that end, we'll provide a general understanding of what IT governance is and some of the challenges boards have faced, leading to a recognition of the complexity of the IT environment, with its many functions, structures, frameworks, roles etc., all of which give rise to a multitude of IT issues and risks. 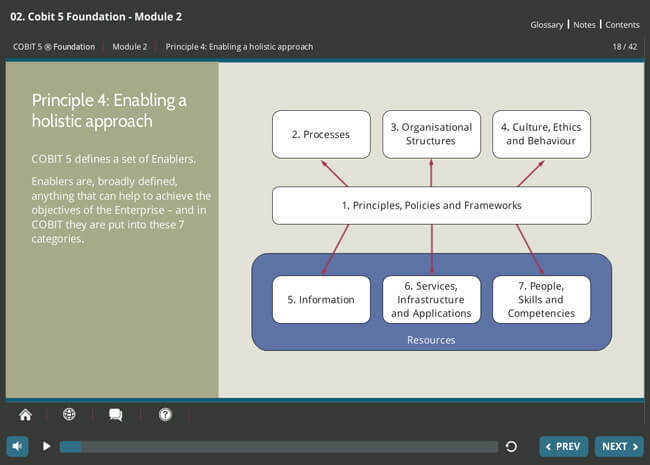 This Module discusses the Fourth Principle of COBIT 5 – Enabling a Holistic Approach. Remembering that the Learning Objectives are the specific things that will be examined in the Foundation Exam, there’s quite a lot of content here. Fortunately, the way that COBIT5 approaches the Holistic Approach means that there is a logic behind the structures that mean these are not particularly hard to grasp. What is striking about COBIT is the degree of separation and clarity of thinking predicated by the degree of separation between the aspects of Governance and Management. This is Principle No. 5 of COBIT, and in many ways the key to the whole edifice. The Learning objectives of Principle 5 are concerned about this separation – and also the pragmatics of the way they have to co-exist and interact – how they feed off each other might be another way of describing the relationship. We will consider these aspects separately as a matter of academic clarity, content in the understanding that in the real world it can be a considerable intellectual challenge to suitably separate them. 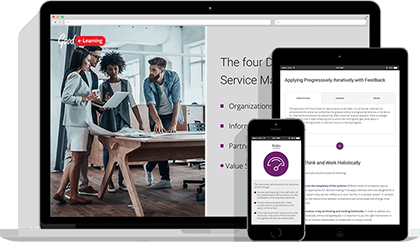 We are progressing well and are getting to the main area of COBIT 5. Much of what we have covered in previous modules is a necessary foundation for the enablers that we will describe in detail here. This is a long module, but is important because it ties together what we have addressed so far. Enablers are factors that, individually and collectively, influence whether something will work. The COBIT 5 framework describes seven categories of enablers and each one will be covered in turn in this module. 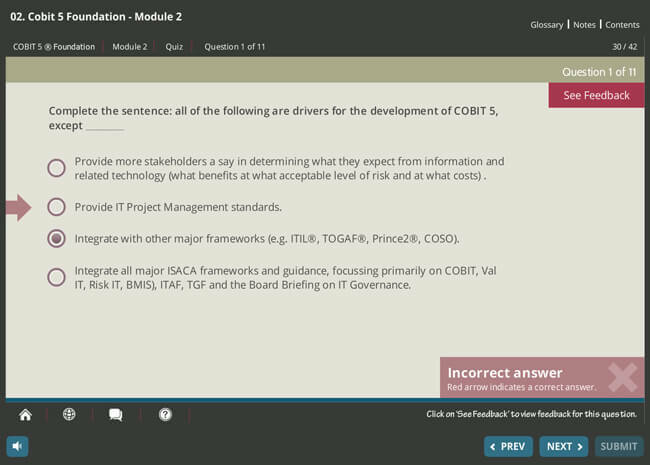 Upon completion of the COBIT Foundation eLearning course, you will have learned everything you need to know in order to prepare, sit, and pass the COBIT Foundation Level exam. 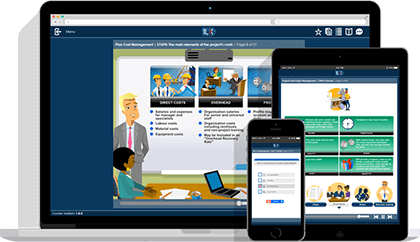 Remote Proctor Now are the authorized providers of exams for COBIT 5. 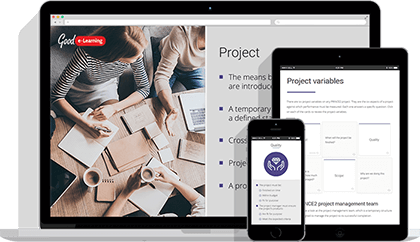 Vistit our page on Remote Proctor Now for more information. 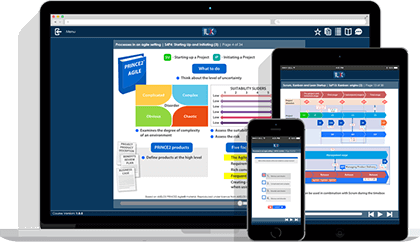 When you have completed the COBIT Foundation eLearning course, you should be ready to start preparing for the Foundation Level exam. 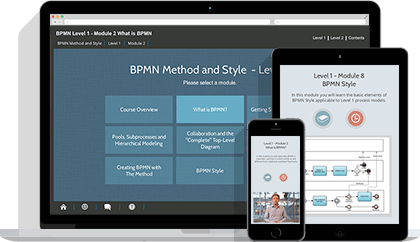 This exam is available to take online, via a web-based examination system provided by APMG. You can take the exam online (virtually) using a service called Remote Proctor Now. When you feel ready to sit the exam, just contact Good e-Learning support or give us a call. Your free exam voucher will be valid for 12 months from the date of issue and must be claimed within 6 months of you first accessing the course.